his summer, consumers will have a chance to partake in one of the wackiest sporting events in animation when Warner Home Video (WHV) releases Scooby-Doo! 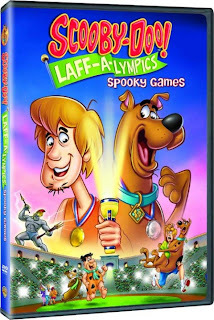 Laff-A-Lympics: Spooky Games on July 17, 2012. Get set to root for your favorite team, the Scooby Doobies, The Yogi Yahooeys or the Really Rottens as they compete in a series of zany sports competitions in exotic locations throughout the world. Scooby-Doo! Laff-A-Lympics: Spooky Games features an all new Scooby-Doo! episode, Scooby-Doo! Spooky Games plus twelve exciting episodes of Scooby’s All-Star Laff-A-Lympics. Scooby-Doo! Laff-A-Lympics: Spooky Games will retail for $19.98 SRP. Let the fun and games begin! Scooby-Doo! and the gang are off to compete at the World Invitational Games in theall-new 22-minute episode Spooky Games! And there’s no shortage of spookiness – the gang’s fun gets sidetracked when a 1,000-year-old statue comes to life and threatens the entire event! Will the games go on? The high jinks continue with world-hopping episodes of Hanna-Barbera’s competitive classic Scooby’s All-Star Laff-A-Lympics! Three teams enter, and all fun breaks loose! Grab a seat as the Scooby Doobies, the Yogi Yahooeys and the Really Rottens get ready, get set, and get into more eccentric events! From bullfights to mountain climbing, roller skating to leprechaun hunting, trek the globe to catch all of the animated antics! Special guest stars abound, including Fred Flintstone and Barney Rubble. This collection is a sure shot to take the gold!